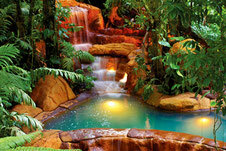 When you reserve the Multi-Adventure package you’ll enjoy the luxury Hot Springs of The Springs Resort & Spa, as well as be able to tour the trails of the Wild Life Sanctuary and Jungle Cats, swim in refreshing natural swimming holes of the Arenal River, and a delicious authentic Costa Rican lunch. 1. 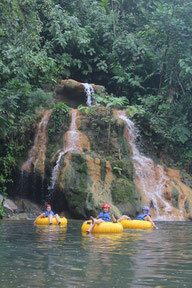 Kayaking: A guided excursion with expert guides on the Arenal River in an inflatable kayak. Ideal for beginners or families with children. 2. 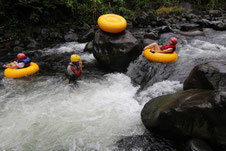 Tubing on Río Arenal: Descend the river on your own inner-tube; designed both for protection and fun so you can get the most enjoyment out of the tour. The tour is about a short but fun 500 meters in length. 3. Horseback Riding: Enjoy a ride on horseback that will take you through forest trails, along the banks of the Arenal River, and down winding dirt roads. 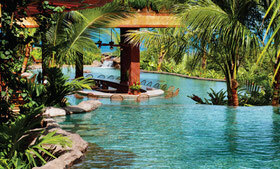 You can enjoy spectacular views of Arenal Volcano and the plains of San Carlos. You’ll have the opportunity to observe nature including animals and birds in their natural habitat; also observe the lifestyle of traditional farm families as you pass by. This tour is perfect for the whole family, regardless if you have experience with horseback riding or not. 4. Guided Forest Tour: Hike to discover the creatures of the forest during their most active period during the day. You’ll get the opportunity to feed some of the animals; later on spend an hour experiencing nature in the tropical wilds. This excursion is educational and enjoyable for adults and children alike. Our expert naturalist guide will explain the most interesting aspects of the plants, animals, and geology of the tropical wilds, as well as about the majestic Arenal Volcano and the history and culture of Costa Rica. 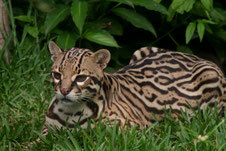 Included in the tour is a stop to feed the jungle cats and toucans! 5. 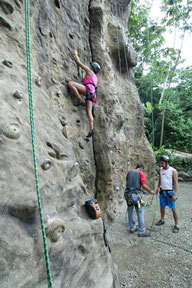 Rock Climbing Wall: Enjoy the largest artificial rock wall in Costa Rica. There are four different difficulty levels to scale, rappel down, and move about in tunnels; all of it a grand adventure! Beginner or expert: you choose. The wall is equipped with routes for every ability level. Leave your fear of heights behind and take advantage of this fun tour. Please bring your swimsuit, a change of dry clothes, long pants for horseback riding, adequate clothing for rainy weather, water shoes with good traction, shoes for hiking, and sunblock. Water shoes are available to rent or by in the Club del Río Recreation Center as well. Note: Please let us know if you need transportation from a hotel in La Fortuna and the surrounding area to coordinate the schedule for transportation. Kids 5 - 10 years old.